~ Writing that is dirt cheap. No really… this is a test post. To see if I can still write. Turns out, I can. Self-deprecating humor aside… this was a test of the new world of Windows Live. You see, all the recent hullaballoo about Apple overtaking Microsoft as the world’s most valuable technology company, has awoken the starry-eyed teenager who took his baby steps into the world of computing on his Windows 95 enabled Compaq Presario – 16 years ago. Though today I am none the wiser, a lot of what I do today and have done in my adult life so far has been in some way touched by the cheery nerd at Redmond. So I decided to rekindle the dormant Microsoft “fan-club” within me by adopting all that they have to offer which is not a browser, OS or Office Productivity software. Take Windows Live for instance. I have been using live email for a couple of years now and I have to say it is not annoying. In fact, it has slowly superseded gmail as my default mail carrier. It has great spam filters, is fast, and gives a great domain name of “live.com”. But Windows Live doesn’t end there. This is what the Windows Live Blog Writer looks like. It even shows my categories and tags and best of all, like a WYSIWYG (What You See is What You Get) editor I can do a real time preview by just clicking the Preview tab at the bottom. It is really as easy as using MS Word. Also unbeknownst to the Facebook obsessed universe Microsoft has quietly released the Windows Live Network – which automatically collects your contacts from the various other networks you are on and works sort of like an aggregator. The problem with MS has always been the fact that they have always been more of a revenue-oriented company. But I have been to Redmond and seen the atmosphere in the halls of the company and met the engineers who work there. These guys are as nerdy as the hippies roaming the halls in Mountain View. What MS needs to do is wear the “nerdiness” on their sleeve. Let the love for technology flow out. Microsoft needs to “free up” a little. The revenues are gonna flow anyway. As Mr.Ballmer so un-subtly put it – 94% of people still buy a Windows enabled computer. What he now needs to do is not take us for granted and show us the human side of Microsoft. Maybe then we will start taking them seriously again. The biggest event in the technology world is, and has always been since the advent of Windows 95, Microsoft releasing a new version of Windows. (Apart from Steve Jobs developing an ingrown toenail etc.) Most of my generation can timeline their lives according to corresponding releases of operating systems from Microsoft. 1993, my first PC with Win 3.1; 1996, my first “real” PC (a Compaq, the first in my building and my pride and joy); 1999, my first serious work PC with Windows NT when I first learnt about services and such; 2000, my first computing mistake with that weird thing called Windows Millenium Edition; 2002, the first time I had an antidote for my Mac envy with Windows XP and a service pack every year hence until; 2006, my respect for Microsoft hit’s an all time low when they tried to give us tremendously shallow reasons to let go of Windows XP SP3 (the most stable and secure Windows OS yet), with Vista. Vista, soon became the poster-child of how a monopoly can undo itself in one fell swoop. Right from performance issues to a convoluted interface (just try to setup a network) to terrible pricing options (Vista Ultimate?!!) – Vista was an example of bad Product Management from the word go. MS did try to salvage some pride with SP1 – but by then it was too late and the verdict was clear – organizations were not about to give up on Windows XP for the Aero interface (probably the only thing I like about Vista… but hey, a few tweaks and an XP system can look as good!). So, when last year, word came of a new Windows version being developed from “ground up” – it was followed by a collective sigh of relief. Deftly marketed at the last Consumer Electronics Show – along with the cool touch interface – Windows “7” as they call it, has had a positive chatter about it since the early betas. Sure enough, Grimescene has tracked the progress since the initial releases, and seen MS correcting a lot of the issues inherent to Vista – while taking the visual direction to higher, more cleaner plane. I allowed the various more jobless people on the internet to test and comment on the betas… until finally Microsoft announced the public release of Windows 7 Build 7100 in early May 2009. This was meant to be a “Release Candidate” – basically a stable system with most of the features and functionality of the final system that would go into production soon. I downloaded it, and installed it and documented here, is my experience so far. In one word – Breezy. Booted from the DVD-ROM on my Compaq Dual Core system with an Intel G33 chipset. After selecting the right partition for install, it pretty much took over the installation – until I was asked to put in my temporary serial number provided by MS (valid till March 2010). So after around 28 minutes I was staring at the login screen of my brand new Windows 7 system. I logged in, and voila – every driver was detected and installed correctly and basically the system was ready to be used. Brilliant. The Desktop – featuring a wider task bar, a clean start button, collapsible system tray and a limited number of widgets like clock, calendar, RSS Feeds etc. on the side bar. Theme Management has been greatly simplified, where in you can choose a new visual theme with just one click. There are static themes and dynamic ones which will rotate the wallpaper automatically after a configurable period. You can also create your own themes very easily. The Start Menu is greatly improved… with all programs and program folders on the left pane itself. To go into a particular program folder – say, Microsoft Office, just click on the folder and the contents cascade down. The Windows 7 Explorer interface (where you access all your files, documents, photos etc.) is clean and has something called “Libraries” – which basically is your media – My Documents, My Pictures, My Music and My Videos. The folders show a preview of what is inside. This is great way to organize your media… esp. if you are a home user. Also what is interesting is that the menu on top is context sensitive and changes to reflect the kind of folder/file you have chosen. Application Switching using Alt+Tab brings up a visual display of all open programs. Taking the mouse over any of the icons will actually bring the application up in the background. The performance of this of course will depend on the amount of RAM you have have on your system. In my 2GB system, it was instantaneous. Microsoft’s answer to Apple’s “Expose'” – Flip 3D is still there, stacking up all open application windows and smoothly scrolling through them as you press Win+Tab. Though it doesn’t work as well as Expose, I like it and use it a lot. Again, a good graphics engine and loads of RAM will help here. Another feature I like and have gotten used to pretty quickly is task bar preview and switch. When you take your mouse over all minimized applications on the Task Bar, a preview window, showing the application opens up just above the minimized icon. The taking your mouse over the preview will automatically bring the application to the forefront. These features have been incorporated to make the OS more attractive to power users such as graphical designers, a group which has long since moved to the Mac platform. Bottomline: The Graphical User Interface of Windows 7 build 7100 still looks a bit incomplete. 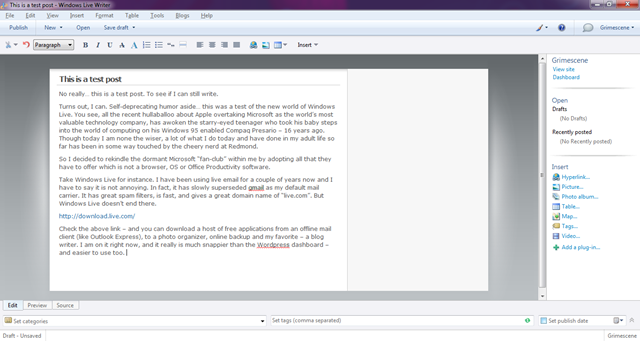 A mish-mash of Vista and some new features. It is still quite a way behind Mac OSX in terms of sheer class… but I also think, this is the best I have seen MS do. An OS is a complex thing. For most users, apart from basic user settings and network settings – what happens under the hood is irrelevant. But if one does need to go under the hood – Windows has always been quite daunting. It took me quite some time to master the inner alleyways of XP, and when I saw what they had done with Vista, it made me want to take up farming. I remember it took me 15 minutes and two cups of coffee (to calm my nerves), before I could figure out where to change my network settings in Vista. And every time I clicked on something – the annoying User Account Control dialog would pop up as if my only job in the world was to molest my operating system. UAC is still there in Windows 7… but it is much less annoying and only shows up at critical junctures. Setting up my network, user rights, internet connection sharing and installing my printer and wireless network cards – were all a breeze with Windows 7. There was hardly any learning curve at all. MS has taken a few steps closer to “Wizard Heaven” – and one can use clearly articulated step-by-step windows to configure most settings. In my opinion this is the easiest Windows to configure yet. 5) Should you buy it? For one thing, I do not envy the chaps in Microsoft Marketing. They have the gargantuan task to convincing customers to move from their current, stable operating environment to a new unknown. A task made doubly difficult by the fact that these customers have spent tremendous amounts of time, resources and emotions getting used to their PC. Microsoft has a marketshare of more than 90% in Operating Systems… most of that being Windows XP. Three service packs later, Windows XP is probably the best operating system out there in terms of stability, hardware and application compatibility, performance, and security. Plenty of third party add ons exist to improve XP in areas of Usability and Graphics. For most consumers already on XP – the concept of the OS as a seperate entity doesn’t exist. For most, the PC is the OS and vice versa. What this means for Microsoft is that, unless one wakes up every morning cursing his XP installation – most people will have no compelling reason to shell out Rs.8000 (or more depending on version) for a new operating system. Enterprises face a different issue. Having trained their staff and having spent lots of money and time in creating a stable and secure IT environment – any organization will look very closely on the benefits in productivity and security (the two main charters of an IT org.) that a new operating environment will bring to the table. Will their employees be able to work better? Faster? In a more secure way? Nothing in my experience with Windows 7 has pointed to this – a spreadsheet or a presentation is still the same. So why should I spend so much money on a new look and feel, especially in these recessionary times? 6) Conclusion – will Windows 7 be a success? Windows 7 is in all probability the best operating system that Microsoft has released after MS-DOS. But that alone does not warrant a resounding success. Vista users, esp. who paid the full license fee, will be up in arms if MS over-charges for a Windows 7 upgrade… as this is really a better, more complete Vista. But it will take atleast a couple of years before enterprises move enmasse to this new platform. Microsoft’s success – atleast in the consumer segment – would lie in pushing for new PC sales. First time users (if there are any left in the world) will love Windows 7… and so will millions who are still running on 2-3 year old hardware and are on XP or older OSes. For the enterprise segment MS will have to focus on aspects such as security, ease of configuration and management of assets and faster performance. But Vista will really take off when there is a disruptive change in the PC itself. One such disruption in the works is “The touch interface”. Having already taken the mobile phone market by storm, MS will push hard to bring touch computing to the masses. Windows 7 has support for touch functionality built in… and something like this might give a fillip to the sales of not only MS Windows… but also the entire computing industry. This post has been written on my Windows 7 system. I like my experience so far…it is fast, good looking and hasn’t crashed even once. But I am still not sure if I will pay so much money just to buy a new OS. I think, like many others, I will wait for my next PC / laptop upgrade to fill Microsoft’s pockets again.